Aqua Leisure Pools of Virginia Beach is a proud reseller of the top pool equipment and products in the business. Whether you need a new pump or filter for your in-ground pool, or want to invest in a durable cover to keep out the elements when you’re not swimming, we will provide installation for the best quality products and pool supplies available. We guarantee a price match on any locally stocked parts. Call us today with your needs. 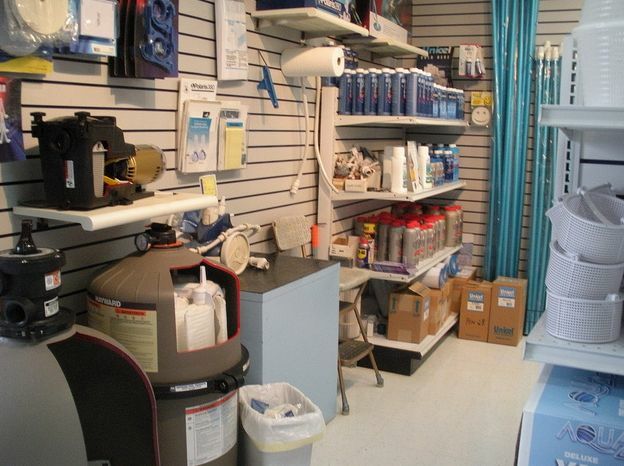 Aqua Leisure Pools offers pool owners in Virginia Beach, Norfolk, and all of Hampton Roads the largest in-store pool parts inventory. Over 95% of our customers find what they need from us that day! Pool EquipmentAqua Leisure offers installation and replacement of pumps, filters, heaters and lighting by Polaris and Hayward, the top solutions in outdoor recreation. If you’re looking for energy efficient pool equipment that won’t hurt your wallet, we can advise you on the best parts for your system. Safety Equiptment Keep your pool environment safe for everybody. Aqua Leisure carries the best equipment for your guests’ and family’s safety. Life preservers, rope floats, and other professional grade devices are available. Pool Games & ToysTurn your pool into a water wonderland! Aqua Leisure pools offers floating loungers, pool volleyball and basketball set-ups, and other kid-safe toys from Swimways to enhance your summer recreation. Fire Shoppe SuppliesWhen the sun goes down, you can still enjoy your backyard experience with a poolside fire shoppe. We help you create your very own hide-a-way with a fire pit and other accessories guaranteed to enhance your summer recreation. You’ll never want to leave your backyard! Don’t let summer pass you by without maximizing your pool enjoyment. Contact Aqua Leisure Pools and let us help you enhance your leisure.